I have a long history with Kingdom of Loathing (or KoL, as fans fondly know it by). It sustained me through my student years where I couldn't afford much of anything, let alone games, by being both genuinely free, and online multiplayer focused and therefore endless - I didn't need World of Warcraft. I had KoL's stick figures. I stopped playing eventually, and never thought I'd ever pick it up again. 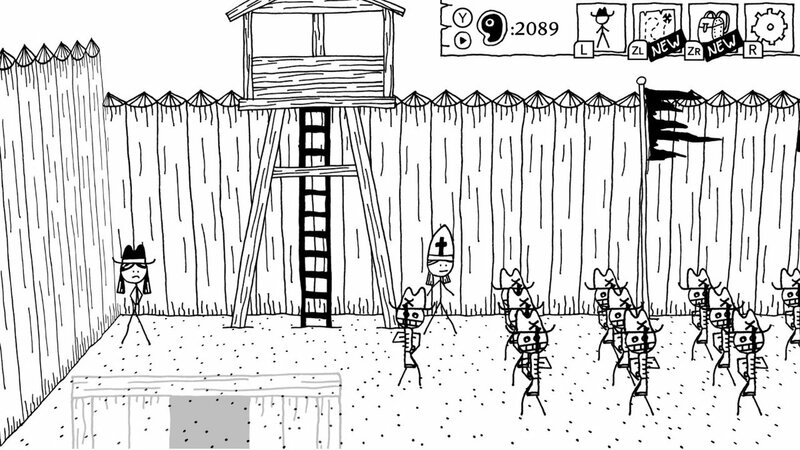 But then West of Loathing landed on my Nintendo Switch; a single-player spinoff of Kingdom of Loathing, with the same aesthetic style. I was instantly hooked, and while thoroughly devouring West of Loathing, I also found myself signing up to play Kingdom of Loathing again... and God help me, I don't actually have the time for any of this all over again. The reality is that both Kingdom of Loathing and West of Loathing scratch a number of itches for me. They share a silly, self-aware sense of humour that comprises a endless barrage of pop culture puns and nerd humour. As someone who has greatly enjoyed the likes of webcomics such as 8 Bit Theatre and Order of the Stick over the years, these games wear the same satirical cap. The stick person aesthetic also appeals to me - I love black & white aesthetics in general, and find that this one marries the humour to the visuals perfectly. And as traditional turn based RPGs with a surprisingly complex skill and upgrade system, I've also found these games to hit all the right nostalgic notes. 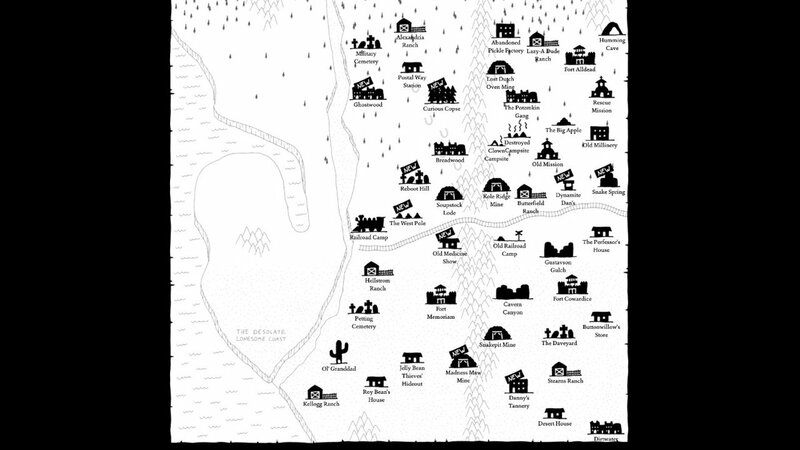 Let's talk about West of Loathing specifically. As already mentioned, this is a single player-only spinoff of Kingdom of Loathing, set in the wild west. Your goals are much the same as they are in any RPG; help people with their various problems and fight lots of enemies, then improve your character's statistics before finally opening up the path to the next area, where you'll encounter tougher enemies and earn even greater rewards. The game has an epic tone to it because, firstly, it is so impressively massive in terms of how much there is to find and do, and secondly, because the journey does take you across the entire wild west. The developers have cleverly condensed this into a series of environments that are never much larger than a single screen; you'll select a point in a map and auto travel there (usually with a random encounter thrown in over the journey), at which point you have a small area to manually explore and (usually) fight your way through. The more you adventure, the more new areas you'll add to your map, each with their own quirks and threats to overcome. And when I say these areas are "quirky," I am understating things - locations you visit in this game range from a skeletal animal petting zoo to a ghost town with the most maddening bureaucratic process you could imagine (and that's just to purchase a pencil), through to an old pickle factory where the ghosts of workers and their pickles have risen up to attack intruders. If there's anything you can say about West of Loathing, it's that it has a wicked sense of the ridiculous. 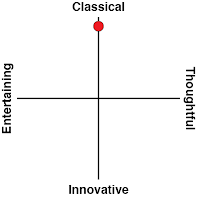 "Ridiculous" is the only way to describe the storytelling, too. There's an awful lot of it, to the point that's its a little surprising just how much reading is involved in playing the game. Thankfully, it's all light and irreverent, and that makes it easy to keep reading through. There was a point where I started skipping through text perhaps a little too quickly for much of it to properly register, though - as you play you quickly become adept in finding the key words in each block of text, and it's just enough to keep up with what the game's telling you, without needing to actually read through every line and every joke. And that's a pity, because while West of Loathing isn't telling a story for the ages, it is charming. Just, perhaps, a little too focused on the puns at the expense of using the storyline to push the narrative forward, so players can ignore too much of it as irrelevant. With that being said, when a quest or narrative sequence stands out, it really stands out as something memorable, and you'll read every word then. Satire and humour are some of the most difficult forms of writing to pull off - particularly when you're relying on pop culture references as heavily as West of Loathing does, and over the course of a full RPG and its dozens and dozens of hours of potential gameplay. So it's perhaps a blessing in disguise that it's possible to "tune out" to a lot of the humour in quests that you're not that keen on, while still following what's generally happening in the story so that when you're deep in a quest that you do find interesting, you're tuned right back in. In other words, the writers of West of Loathing have pulled off a small miracle and figured out how to write a comedic RPG in which the jokes and humour never start to feel draining and overdone, by doing so in such a way that you'll only really be paying attention to the jokes you find funny. Narrative is one thing, but the real reason that I think this entire franchise has managed to sustain itself for so long is that, mechanically, the Loathing games are actually quite rich and nuanced. Surprisingly so. Combat plays out in a familiar turn-based manner, but characters build up a rich variety of skills and abilities to choose between, and this helps them, in turn, deal with a wide range of different enemy types. Outside of battle, players can earn a huge range of "perks" and "debuffs" based on their actions in quests or when simply exploring around the world. Not all of them are good. Read through a necromancer's book, for example, and you'll learn a great new spell, but at the cost of a "perk" that slashes your health. 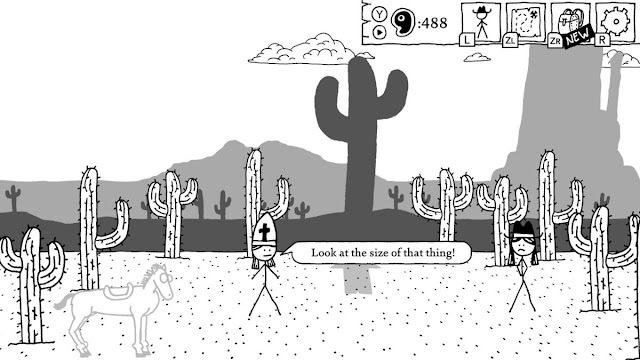 In fact, the inter-connectedness of absolutely everything in West of Loathing is its most appealing facet. An item that you find in area A might help you unlock a perk in area B that, a few more areas later you can use to get past an otherwise impassable spot to receive really good loot... but only if you have levelled up your lockpicking skills enough, or found the key in area D. Many problems have multiple solutions, based on how you've raised your character (for example, some will allow you to smooth talk your way to a reward, assuming that you can speak the language of the enemy and have enough points in your smooth talking statistics. West of Loathing has all the freedom of a "proper" western RPG wrapped up in that humble shell, and most of the quests are completely optional, but you won't be able to stop yourself exploring and completing them just to see how they fit into the overall web. 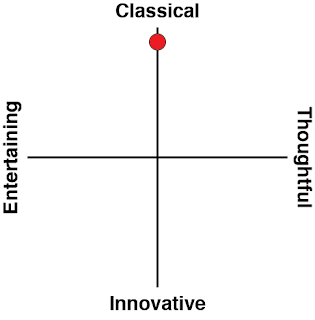 Even more amazingly, given how many variables this game tracks, not once did I have West of Loathing bug out at me. I was never left with a mission that couldn't be completed because I had lost or used up a critical resource. I would have loved to see the planning board for this game - the number of strings and cards pinned on to it just to figure out how all the quests would have made the most labyrinthine "serious" plot look basic. A consequence to all this is that you do end up with a lot of stuff, and inventory management in West of Loathing is appalling. I stopped trying to keep track of the stuff I did have and just assumed that, as long as I was diligent in turning over every stone in every location I visited, I'd have the right item for each quest as it popped up. For the most part this was a successful strategy. However, it did have the consequence that much like how I started to tune out to the storytelling specifics in the game, I also stopped paying attention to what items I was using for each quest. I was powering through the game, but not really taking it in. The only other issue I had was the quest log system was terrible. You do have a "partner" on your character's journey who you can talk to and who will remind you of an ongoing quest or two that you need to complete, but this game encourages you to be juggling a lot of balls at once, and if you take a couple of days break from it, it's far, far too easy to lose track of what you had planned to do next. Furthermore, because all the quests tend to roll into one another, there's no real convenient moment to stop playing with a clean slate, ready to pick things back up again the next time. That is, perhaps, a consequence of the game's heritage as a never-ending online multiplayer "MMO," but it's not a particularly friendly way of doing things in a single player game. 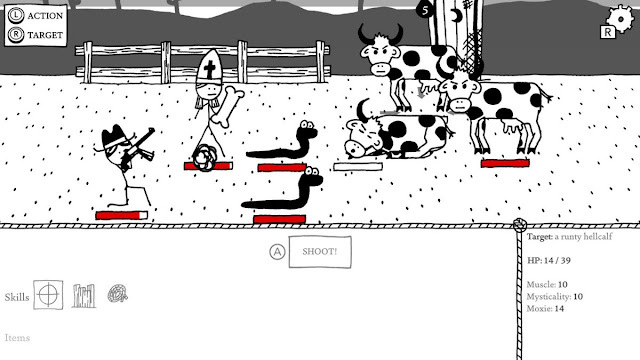 I truly love West of Loathing. It's charming, silly, fun and, most surprisingly, offers genuinely engaging combat and questing. This made it easy to play until my Nintendo Switch battery was running flat over, and then have me itching to play again while the battery was charging. And it did convince me to start playing Kingdoms of Loathing again. I guess I'm never going to get away from these nonsense stick figures.